On my recent visit to Papua New Guinea, I came across a small booklet produced by the National Community Transformation Network, entitled Tear Down The Idols: A Call To The People Of Papua New Guinea To Destroy All Idolatrous Objects – [Tear Down The Idols (PNG) booklet]. 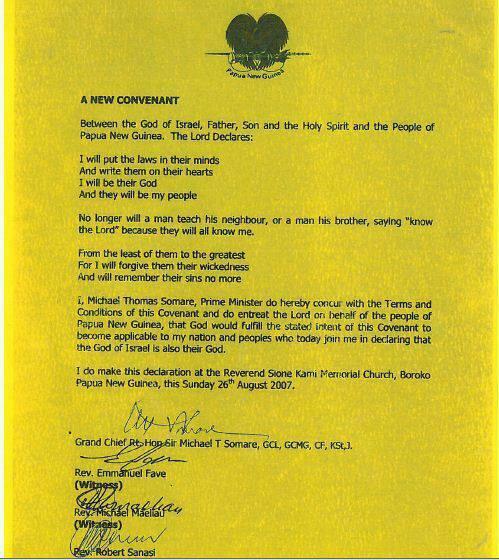 This was prepared and circulated to church leaders throughout the country in the lead-up to this year’s National Day of Repentance public holiday, 26 August 2015, less than a month before the fortieth anniversary of PNG’s independence on 16 September 1975. Pastors’ fraternals all over PNG welcomed the call and organised united ‘Marches for Jesus’ on this day through their towns. Along with the standard public holidays of New Year’s Day and the Christian holy days (Christmas, Boxing Day, Good Friday, Easter Saturday, Easter Monday), the National Day of Repentance has recently been instituted as a fourth public holiday with specifically national significance for PNG, alongside the Queen’s Birthday, Remembrance Day and Independence Day. The National Day of Repentance, or ‘Repentance Day’, was authorised as an annual day of Christian prayer in August 2011 by Prime Minister Peter O’Neill (the first document he signed as PM) following a request by a group of churches to his predecessor, the acting Prime Minister Sam Abal. Abal had stepped in for Prime Minister Sir Michael Somare who was taken ill at the end of his fourth term of office (1975 [independence] – 1980, 1982-1985, 2002-2007, 2007-2011). It seems that the choice of 26 August for this new public holiday corresponded to the date in 2007 when Somare as Prime Minister signed the following covenant between the people of Papua New Guinea and the God of Israel. “Now, in the name of our Lord Jesus Christ, and by the power of the blood of our Lord Jesus Christ, I the Prime Minister and Founding Father of Papua New Guinea on behalf of the People of Papua New Guinea repent our iniquities and transgressions, and rededicate our nation to your Almighty God. I renounce the worship of all IDOL and all EVIL gods. I renounce all covenants with the evil spirits and demonic powers. I renounce and reject all their actions and I reverse all their evil effects. Almighty God and eternal Good Shepherd, forgive our sins against you and against one another. Deliver us from evil, heal us, heal our land, and grant us your peace and joy. Make us a holy people, pleasing to you in every way. Today, as the Prime Minister of Papua New Guinea; and on behalf of the people and the nation of Papua New Guinea, I make this New Covenant with you and Almighty God, we acknowledge you as One and the ONLY God, we acknowledge you as the only God in whom Papua New Guinea stands. We acknowledge the Lord Jesus Christ, our Lord and Savior, we acknowledge the power of the Holy Spirit in our lives in the nation of Papua New Guinea. On this day I pledge our allegiance to serve No other gods but YOU, God the Father, God the Son, and God the Holy Spirit. Eternal God, our good Shepherd, as Prime Minister and Founding Father of Papua New Guinea, I submit Papua New Guinea today, its people, its leaders in Church, leaders in the villages, all its leaders of the country into your almighty hands. Theodore Zurenuoc was appointed Speaker of the National Parliament on 3 August 2012, just before Peter O’Neill was elected Prime Minister, and in November 2013 he and the five-member House Committee began a process of removing spiritual artefacts in the Parliament building. Something similar had been attempted in 2000 by a predecessor as Speaker (1999-2002), Bernard Narokobi, who had helped to write the PNG constitution, when he installed temporarily an illuminated cross on the pinnacle of the Parliament building (Gibbs pp.9-10). Zurenuoc’s initial removal was of the lenticul (nineteen carved heads on the lintel of the entrance, representing the nineteen provinces of PNG), and since then the fifteen metre high installation of three ‘indecent’ carved totem poles in the State Hall has been undergoing a lengthy process of dismantling. Shortly before removal work began, in October 2013 the Prime Minister of PNG, Peter O’Neill, led a senior delegation of Government officials and business people to Israel, where a declaration of cooperation was signed between the two governments. Further connections with Israel can be seen in the national collection of money on this year’s Repentance Day as an ‘Aliyah’ offering to help Jewish people wishing to return to Israel. During its removal, the lenticul was cut into three pieces, and it was then offered to the National Museum. When the Museum objected, the artefacts were left in a garage of the Parliament until someone removed them into his own possession, according to Andrew Moutu, Director of the National Museum and Art Gallery. Other supporters of this programme of redecoration such as Rev Joseph Walters have clarified that such spirit-defined carvings belong properly in the Museum as objects of PNG’s past, rather than in the national House of Parliament as guiding principles for its future. Although there have been objections from a number of people, including Members of Parliament and the official Catholic Church in PNG, there are many others who support the changes to the Parliament building. Outside observers such as Merlan & Rumsey (pp.14-15; see also May’s conclusion, p.9) have noted how the vast majority of ‘grass roots’ people in towns around the country, including lay Catholics and PNG-born priests, would agree with these actions, lacking any nostalgia towards traditional customary practices. For example, a group of fifteen pastors wrote a joint letter in support of the changes on 15 January 2014. In place of the triple totem pole in the State Hall, Zurenuoc has been preparing a ‘Pillar of Unity’, incorporating a rare first-edition first-issue copy of the 1611 King James Bible. This Bible was donated to PNG by Dr Gene Hood from Indiana, USA, who had sponsored Christian radio stations and missionary work in the country, and who passed away just days after handing it over to Zurenuoc and other MPs at a convention in Ohio. Zurenuoc also apologised at the time on behalf of the nation of PNG for its mistreatment of Christian missionaries in previous generations. The Bible arrived at Jackson’s Airport in Port Moresby on 27 April 2015, welcomed warmly by Prime Minister Peter O’Neill, politicians and religious leaders, and a crowd of about 20,000 people. The new National Unity and Identity Monument will be unveiled in a public ceremony on 16 September 2015, the fortieth anniversary of PNG independence. Zurenuoc has set out his vision for a restored Parliament and a united nation of Papua New Guinea in an article last year in Business Melanesia – PNG Parliament restoration & unity project April 2014. Despite vocal objections from a small minority within and especially outside PNG, this project seems to be moving forward with widespread approval. Let us pray for wisdom and protection for all of those who truly love PNG and are working for its good, as the country celebrates its fortieth year of independence in one week’s time.